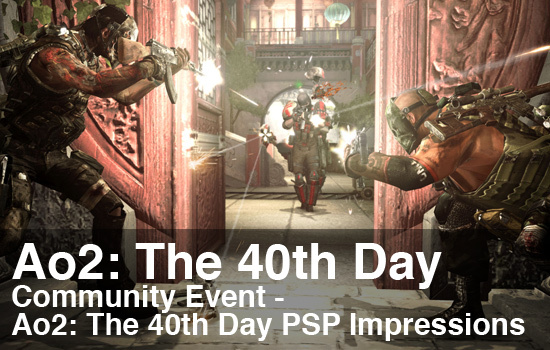 Our coverage of the Army of Two: The 40th Day Community Event that was held last week concludes today with a hands-on impression of the PSP version of the game. As the game’s producer, Joe Khourry, pointed out in our interview with him, the PSP version of the game takes on more of an arcade feel than its console brethren, meaning that some features that are present in those versions aren’t present here. However, not to be outdone entirely, the PSP version does offer a few unique features of its own. First, let’s review what’s the same between the PSP and XBox 360/PS3 versions. Players won’t be missing out on any of the story offered by the console versions as the story and levels are all the same. You actually get a little bit more with the PSP version as it includes a couple of extra levels and side stories that aren't in the console version. You’ll still be playing through the game as either Salem or Rios, and you’ll still be balancing aggro and using team tactics to overcome some of the harder enemies in the game. Players will face set moral choices in the game, like “do you take the police officer’s guns or do you leave them,” as well as other moral choices that just occur in the game without any prompting, such as rescuing/shooting a hostage. Here, though, is where the similarities end. The third-person shooter mechanic is scrapped and the game plays much like a twin-stick shooter where the second stick has been replaced by buttons. The left hand joystick/nub controls Salem and Rios’ movement while the face buttons shoot in the direction that they would be mapped to on a compass face, i.e., pushing triangle shoots up, pushing circle shoots right, and pushing both shoots diagonally. Fortunately, there’s an auto-aiming mechanic in place so if an enemy is to your left, you just have to push the square button and the bullets will fly in his direction. Salem and Rios also now have health bars that are displayed on-screen and quickly deplete as they receive damage. Instead of the usual “hide behind cover until your health goes up” mechanic present in the console versions, enemies will drop health packs that restore a portion of Salem or Rios’ health. This can lead to the age-old debate between players of who needed that health pack more, but should your partner fall due to an inconvenient sense of self-preservation, you can still revive him, good as new with a full health bar to boot. Of course the best option is to avoid the enemies’ bullets altogether, and Salem and Rios can make use of cars, barricades, and anything else that resembles a shelter from incoming fire by pressing the right shoulder button to duck into cover. The directional pad is used to issue orders to your partner A.I., playing solo, and the down button is used to swap between your two weapons. In the interview with Joe Khourry, he highlighted games like Contra, Smash TV, Robotron, and other arcade dual stick shooters as being the inspiration for the PSP version of the game. 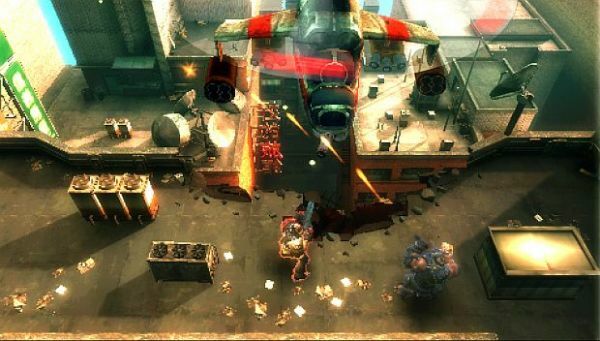 While those influences are definitely apparent, playing the game felt more like another co-op title that is dear to my heart, The Red Star, a game that owes much to the aforementioned titles in its own rights.